NRA-ILA | Who’s Crying Wolf? As the debate about wolf hunting swells out West, the author says the future of responsible wolf management remains far from certain. Ryan Counts, a hunting guide from Pray, Mont., sighted a mature wolf on Oct. 3, 2009, and grabbed his rifle. He was hunting elk on Buffalo Plateau north of Yellowstone, an area where the Northern Yellowstone elk herd plummeted 67 percent between 1994-2008, a tumble in which wolves played a chief role. He had a wolf tag. This was his chance to do something about the wolf population. He found out later the wolf he shot was known as “No. 527.” It was a female born in 2002 into what had been Yellowstone’s Druid Peak Pack, a pack made famous by the PBS documentary “In the Valley of the Wolves.” He didn’t know “wolf watchers” had named this wolf “Bolt” because it had a Z-shaped marking on its hip. But, even if he had known, he says he would have killed it nonetheless. Such was the dramatic divide between views of the first modern wolf seasons in Montana and Idaho. How Did the Season Go? With an estimated population of at least 1,645 wolves in Montana, Idaho and Wyoming, the U.S. Fish and Wildlife Service (USFWS) finally followed its own guidelines by removing Endangered Species Act (ESA) protections from wolves in the northern Rockies in May 2009. After a series of court challenges, seasons were enacted in Idaho and Montana this past fall and winter to manage the wolf populations. At press time, Wyoming’s wolf-management plan had not been approved by the USFWS; as a result, the Cowboy State wasn’t allowed to conduct a season in 2009. Wyoming is currently fighting for its plan in court (see sidebar, “Wyoming’s Wolf Fight”). This urban viewpoint doesn’t function in reality, says Ed Bangs, USFWS western gray wolf recovery coordinator. He says the wolf season in Idaho and Montana was hardly “indecent.” Bangs explains that the ESA is not a good tool for managing a wildlife population. It is only useful for recovering a population, and wolves surpassed minimum numbers set by the USFWS years ago. The idea that wolves should find “their own balance in the Rockies” is also a false premise proved with each cow and sheep wolves kill, says Sime. People live in every ecosystem in the West—no matter what a Manhattan-based newspaper says—so people have to participate in the predator-prey system. Wolves and grizzlies don’t belong near Montana school bus stops any more than they do in Central Park. A winter drive out of ski resorts in Jackson Hole, Wyo., or Big Sky, Mont., and into the lower-elevation valleys below would illustrate this point, as doing so would show any visiting wolf lover herds of elk that have come down out of the snow-laden mountains to wintering areas. These wintering areas are habitat that groups, such as the Rocky Mountain Elk Foundation, have worked hard to preserve. Seeing thousands of elk and deer wintering along roads and near ranch houses and towns should be evidence enough that people and wildlife share the same habitat and so have to find a balance with each other, a balance maintained with science-based hunts, say the game agencies. One reason for having a wolf season, say biologists and hunters, is that elk populations are being severely impacted in some areas by wolf predation. In Montana’s Madison Valley, for example, a study done by FWP indicated that during the winter of 2002-03 wolves killed .125 elk per day, which was the equivalent of each wolf killing 23 elk from November-April. In the Northern Yellowstone Range—the area where Counts shot wolf No. 527—wolf kills on elk fell from an estimated 11 per wolf from November through April to about 7 as the elk herd plummeted. Another factor is that when wolf populations outgrow wild areas and/or their natural prey base declines, more wolves kill livestock. In 2008, for example, Wildlife Services, a division of the U.S. Department of Agriculture, spent more than $1 million killing 264 wolves that preyed on livestock in the Rockies. 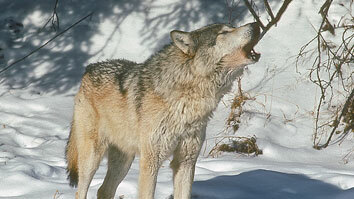 Agencies also paid livestock owners more than $500,000 for losses to wolves in 2008. Bangs believes licensed hunters will make Wildlife Services’ job of controlling depredating wolves easier and cheaper. Some of the livestock kills have been horrific; for example, in Dillon, Mont., on Aug. 16, wolves killed 122 sheep on the Rebish/Konen Livestock Ranch. Wolves consumed very little of the fresh mutton. Wildlife officials later opted to kill the entire wolf pack. So environmentalists, especially the anti-hunting group Defenders of Wildlife, are indeed crying wolf, say state and federal officials. Another person, Nora, wrote, “[Hunters] kill with the excuse that there are too many [wolves]. So the anti-hunting viewpoint can be anthropomorphic, but conversely it can also be anti-human. Their reaction to wolf No. 527’s life story is a case in point. No. 527 left the Druid Peak pack and joined the rival Slough Creek pack in 2005. No. 527 rose in the pack’s hierarchy and bore pups. Later, the pack’s den was attacked by another wolf pack. For 12 days, 527 and probably four of the pack’s other females and their pups were pinned inside their den. A PBS special documented this siege. No. 527 finally escaped. The pups didn’t. Not long after, 527 left the Sloughs and joined up with a male wolf in an area along Hellroaring Creek. That spring, they encountered a young wolf pair in the area. Wolf No. 527 and another wolf killed that female wolf in her den and carried out the wolf’s pups and ate them. Lyman and other activists seem able to understand a wolf’s need to defend its food source, territory and right to exist, yet they somehow can’t comprehend that people have these same needs and inherent rights. They actually give wolves, and other wildlife, more rights than humans. This attitude is making responsible wolf management a constant uncertainty. At press time, a group of anti-hunting organizations, represented by the environmental law firm EarthJustice, was suing the USFWS and state game agencies to force them to again list the wolf in the northern Rockies as endangered. The suit was due to be heard by U.S. District Judge Donald Molloy this spring. The decision could go either way. Last year, Molloy overturned a decision by the USFWS to remove grizzlies from the ESA because he felt the decision didn’t take the effect of global warming on grizzlyies' food supply into consideration. Therefore, the future of responsible wolf management remains far from certain.